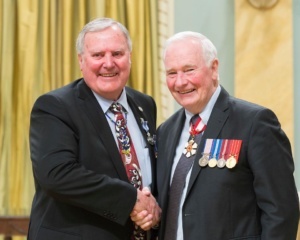 – August 2nd, 2017 – Robert (Bob) Cullimore Blacker was one of 36 Canadians to receive a medal from the Governor General on Friday, June 23, 2017. The Governor General’s Meritorious Service Decorations were established to recognize the extraordinary people who make Canada proud. A recipient need to be innovative set an example or model for others to follow or respond to a particular challenge faced by a community. Governor General David Johnson presented the decorations at around 10:30 am in Rideau Hall. 36 Meritorious Service Medals, along with 13 Meritorious Service Crosses were distributed. Created by Her Majesty Queen Elizabeth II, Meritorious Service Decorations recognize Canadians for exceptional deeds that bring honour to our country. In 1991, both the cross and medal were introduced for civilians, rather than just for the military. 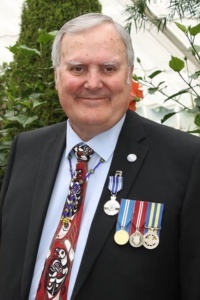 From the GG website, it reads, “As the prime mover behind Write2Read, Robert Cullimore Blacker helped bring permanent and up-to-date libraries to rural First Nations communities across British Columbia. His ability to connect volunteer organizations, social responsible businesses, and First Nations resulted in donations of trailers, books, computers and high-speed broadband connections used to increase literacy and Internet access in isolated communities.